What makes Celebrity Authentics Auctions special? Our screen used items are exclusively certified and authenticated by the originating studio, prop master or actor – no exceptions. What is the value of an opinion when an opinion can be wrong? Our authentication is not to be confused with others who base validity of their screen used items on speculation or comparison. When you choose to purchase from Celebrity Authentics Auctions, you know that it is 100% authentic. Assurance of Authenticity not only provides peace of mind, it ensures your investment. Every screen used item from Celebrity Authentics Auctions is accompanied by an industry defining Letter of Authenticity noting the assigned authentication serial-number, description of features and an image of the item for unmistakable matching. Additionally, each document is hand-signed by either the representing source or actor, and a Celebrity Authentics representative. Each certified item can be verified through our online database, providing collectors with the ability to confirm that their screen used props and wardrobe are genuine. 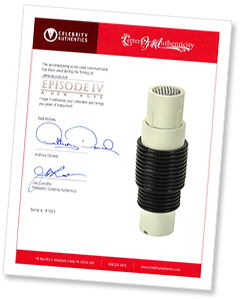 Prior to release, screen used props, wardrobe and select items, along with their accompanying Letter of Authenticity, are traced with a clear solution that contains a proprietary DNA exclusive to Celebrity Authentics and visible under a unique reader. Like DNA itself, Origin ID associates an object with a unique identity, permanently and forever. This military grade tracking guarantees authenticity and eliminates any potential duplication. The Celebrity Authentics Authentication System is the recommended form of authentication by the FBI to properly eliminate fraud. For these reasons, Celebrity Authentics Authentication of your item greatly enhances its value.